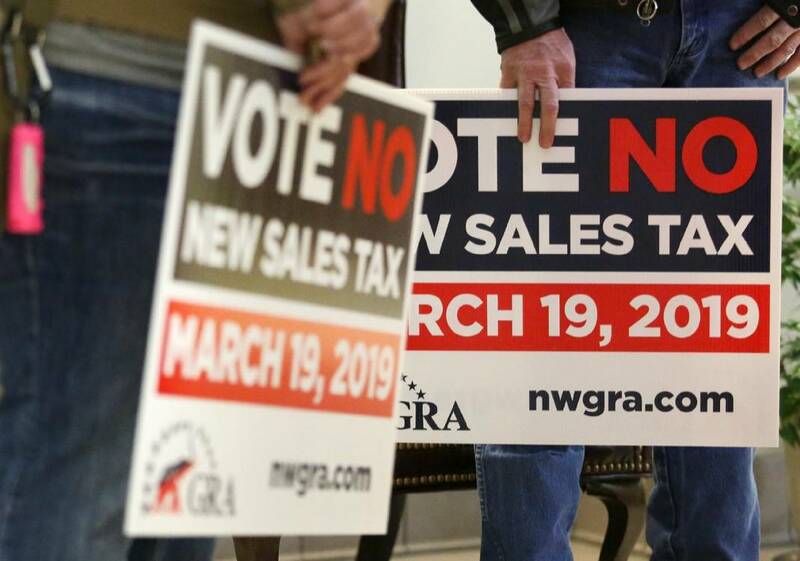 Protestors of a new Transportation Special Purpose Local Option Sales Tax hold signs before the Catoosa County Commission meeting at the Catoosa County Administration Building Tuesday, February 19, 2019, in Ringgold, Georgia. The TSPLOST was proposed as a way for the county to bring in a projected $60 million in revenue over the next five years for work on roads and bridges. DALTON, Ga. — Whitfield County Commission Chair Lynn Laughter knew her effort to renew a sales tax referendum was deeply in trouble about a month ago, when she invited residents to tour an old government building. Laughter invited members of the community to tour Administration Building #2, where the accountability courts meet. A former church, Laughter said the downtown building is about 80 years old. The basement floods, the toilets don't flush and the HVAC system continually breaks. If voters approved the Special Purpose Local Option Sales Tax on a referendum, the commissioners promised to tear down the old building and construct a new home for the courts. But that night, Laughter recalled, only about a dozen people showed up. About 15 miles northwest, the Catoosa County Commission ran into similar problems. It held five public meetings to educate voters on the need for a new Transportation Special Purpose Local Option Sales Tax. In three of those meetings, Commission Chair Steve Henry said, fewer than 10 people showed up. "It's almost like it didn't matter," he said. Laughter and Henry believed the referendums would pass in a close vote. In Whitfield County, officials projected the tax would generate $100 million over six years. In Catoosa County, they expected $60 million over five years. Voters defeated the referendum in Catoosa County on Tuesday, 4,840-1,399. In Whitfield County, voters rejected the SPLOST initiative, 3,605-2,617. Whitfield County will now be one of four counties in the state without a SPLOST. "It is devastating for our county," Laughter told the Times Free Press on Friday. " Dalton has a lot of momentum right now. And honestly, this negative SPLOST vote has taken a lot of wind out of our sails." In both counties, elected officials did not expect strong opposition when they announced the referendums last year, and they were caught flat-footed by disciplined, organized "vote no" efforts. In both counties, the young conservative political group Northwest Georgia Republican Assembly spread yard signs, issued mailers and relentlessly attacked the referendums on Facebook. Engaged Citizens for Georgia, a ballot initiative committee led by local Ace Hardware owner Jevin Jensen, held public meetings against the Whitfield County referendum. He also ran "vote no" ads on the front page of the Dalton Daily-Citizen News for three days before the election. "I am not voting for another tax increase," said Diane Putnam, chair of the Whitfield County Republican Party. "Most of the residents do not have confidence that our city council and our county commissioners are really concerned with lowering taxes, spending within the budget of what we have, what comes in. They just seem to always want more." Historically, defeats like these are rare. From 1998-2017, a Times Free Press analysis found, voters approved 94.5 percent of county-wide sales tax referendums. But northwest Georgia residents have pushed back at an usual rate the last couple of years. In Catoosa, Dade, Walker and Whitfield counties, voters have only approved two of six referendums since November 2017. This area has long been deeply conservative. But now, activists to the right of mainstream Republicans are dominating. Some voters said they have been emboldened by recent state and federal elections. Northwest Georgia voters showed up to the polls at a much higher rate for Donald Trump than they did Mitt Romney. Gov. Brian Kemp saw a similar uptick here compared to the support Nathan Deal received in 2014. Asked why people were rejecting these referendums so much, Northwest Georgia Republican Assembly member Denise Burns said, "The people who are paying attention to the way things are going on in Washington and the entrenched bureaucracy, the way the establishment and the media have tried to diminish the president in every possible way, they're motivated. There is a bureaucracy that seeks to maintain its level of comfort, at the expense of us who work hard and pay taxes and create the wealth to begin with." Added 14th Congressional District GOP Chair Ed Painter: "[Commissioners] keep asking for bigger projects and to go longer on the taxes. It's starting to wear. It's showing all over." Staff photo by Erin O. Smith / Mark Nollman holds a piece of paper reading "Vote No New Sales Tax March 19, 2019" during a Catoosa County Commission meeting at the Catoosa County Administration Building Tuesday, February 19, 2019 in Ringgold, Georgia. 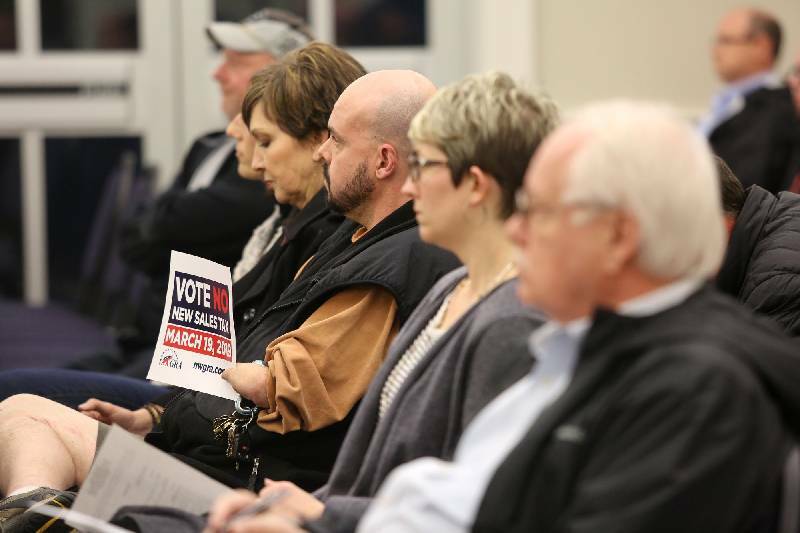 A group of individuals attended the Catoosa County Commission meeting in protest of a proposed 1-percent tax increase. Sales tax referendums usually pass with bipartisan support, University of Georgia Professor of Political Science Charles Bullock said. The General Assembly passed a bill to allow local governments to introduce 1 percent sales taxes in 1985. At the time, Bullock said, local governments struggled to increase property taxes without public outcry. Putting the burden at the cash register was an easier sell because residents from other counties would bear part of the load. When counties and cities introduce the referendums, they also create project lists with estimated price tags, showing exactly where the revenue will go. The law restricts how local governments can spend this money, creating more public trust. SPLOST revenue can only go to capital projects, like renovating a building, for example. "That was the selling point on these," Bullock said. "You knew where the pennies were going to go. Going back to the earliest days of SPLOST: There was a degree of mistrust [with local government]. This is a way to get around it." But when the Whitfield County Commission introduced its SPLOST list in December, Jensen and other opponents balked. In particular, they felt the county would spend too much money on new buildings. While Jensen conceded that Administrative Building #2 needed to go, he objected to the commissioners' plan to tear down a second government building that he didn't think was in bad shape. In total, the county planned to spend $23.8 million on two buildings. "It seemed like $100 million in search of projects," he said, "instead of mission-critical, necessary developments." In mailers and at public meetings — which drew crowds of about 90 people, Jensen said — opponents hammered the commissioners for saying 30 percent of sales tax revenue came from out-of-county visitors. Laughter said the commissioners couldn't prove this number; it was just a guess. But the attack made the elected officials look like liars. She added that the SPLOST list included $17.3 million for road, bridge and culvert improvements, as well as $2 million for fire and police vehicles. These are needs that the county can't ignore, she argued. "Those same people who helped defeat the SPLOST are going to be the same people who come out and fuss and fuss at us about having to raise our [property] taxes," Laughter said. "People think we have fluff in our budget. We don't. We don't. We don't have $20 million that is sitting around." In Catoosa County, Burns and other opponents railed online against the commissioners' T-SPLOST. They said the project list wasn't detailed enough. When the commissioners promised to build a bridge over the railroad tracks in Graysville, opponents said the move was "disingenuous," only a move to prop up votes at the last minute. Burns said the commissioners did not have the public's trust. Though only two of the members are still on the board, she criticized the elected officials' decision in 2012 to back half of a $20 million loan from Erlanger Health System to Hutcheson Medical Center. When the Fort Oglethorpe hospital went bankrupt, the county paid $6.2 million to Erlanger in a settlement – money Burns argued could have "paved a whole lot of roads." She and other critics argued that only the county's developers benefit from the tax to improve infrastructure. Henry, himself a developer, lamented this week that he and the other commissioners could only sway 22 percent of the voters. He sees criticism on Facebook that the commissioners are irresponsible with money, despite dropping the property tax rate the last two years, a tax rate that's about 30 percent lower than Walker County's. "We didn't have a trust issue before," Henry said. "Everything was just so smooth. We didn't have any controversies. Everything runs right along. We come in under budget. The only public trust issue we had is what [opponents] created, unfairly." 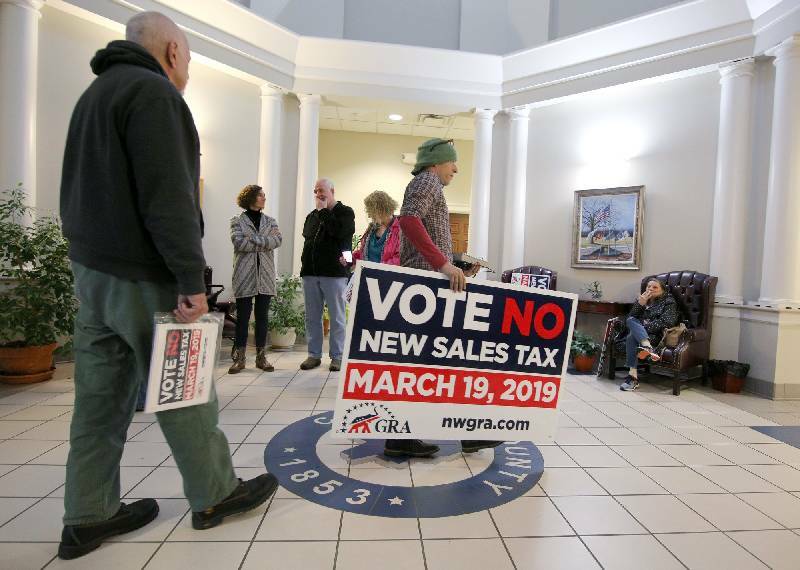 Staff photo by Erin O. Smith / Eric Morrison walks into the Catoosa County Administration Building with a large sign in protest of a sales tax increase Tuesday, February 19, 2019 in Ringgold, Georgia. A group of about 10 individuals showed up to the Catoosa County Commission meeting Tuesday to voice their objection to the additional 1-percent tax increase saying it would put an extra burden on those in the community couldn't afford it, would encourage people to shop online where sales tax may not be required or cause locals to go out of town to shop. Dade County Commissioner Allan Bradford said last week he has felt the same way as Henry and Laughter. Dade County tried to pass a T-SPLOST in November 2017 and May 2018, losing both times with about 42 percent of the vote. Walker County Commissioner Shannon Whitfield was much more successful. When he put the T-SPLOST item on the ballot in November 2017, 70 percent of people supported it. Whitfield unsealed three bids for a 23-mile paving project, funded by T-SPLOST, last week. He will award a contract during a meeting Thursday night. Whitfield said voters passed the referendum because he lay the groundwork for months. Whitfield held public meetings in the summer of 2017, outlining the county's most recent audit for voters. He told them that the county would miss $1 million in state grants if they didn't pass a T-SPLOST, because he couldn't produce the necessary matching funds otherwise. The night before the election, he answered questions about the T-SPLOST for 80 minutes on Facebook Live, drawing 5,700 viewers — a higher number than the next day's actual turnout at the polls. But for all his hard work, Whitfield admitted he also benefited from something other commissioners can't draw on: A predecessor who left the county $70 million in debt. Whitfield told voters the debt was "our inheritance." He explained they had to live with higher taxes, just to pull the county back into a respectable position. Dean Kelly, the former coordinator of the Walker County Tea Party, said Whitfield "did a good job of selling the need for it." "We're in a bad shape financially," he said. "[Voters are] willing to go the extra mile. But once the T-SPLOST expires, I think they're going to have a harder time getting that passed."